Just Jingle: Soy Happy For You! Nope. Not a typo. Not even a little bit. Just a post title STUFFED to the BRIM with punny goodness! You know I'm a fan of a hilarious pun, right? If not, you have now officially been warned. Err.... I mean, informed, yeah.... that's it. ACK! So fun! I actually won this stamp set quite awhile ago and being that I'm pretty much the only person in the entire world that doesn't love sushi (I have tried, folks, I really have...I WANT to be a cool kid and like sushi, but it's just not my thing. I have failed at being a proper hipster, I am aware), SO...that made this set trickier for me to use for some reason. I know... that doesn't make much sense, but just go with it, K? K. Thanks. Glad you've got my back on this. AND THEN... we got invited to an engagement celebration. I don't often have opportunity to create engagement cards so I had to be a bit creative and I KNEW this couple would totally appreciate a good solid (and obviously hilarious) pun. I did it. And I love it. And it makes me happy. I colored the images with Spectrum Noir pens and die cut them. 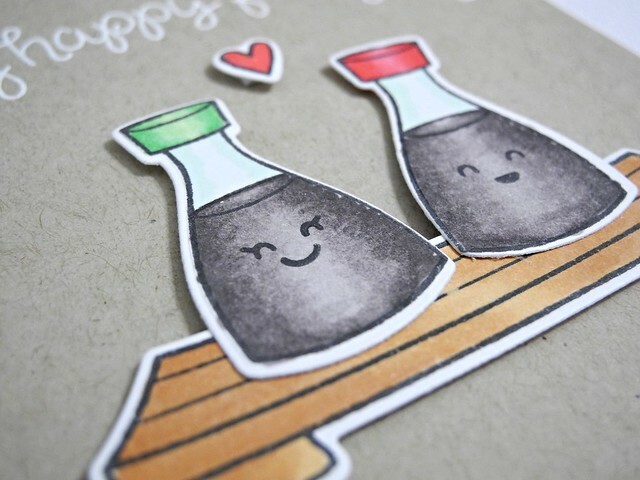 There is a cute piece of sushi INSIDE the card, along with a simple 'congratulations' from another Lawn Fawn stamp set, but, alas, I forgot to photograph it and I actually gave this card to someone, sooo.. ooopsies! For reals, though. It's cute on the inside. I promise. So cute! Love this one! fun card. Don't you just hate when you send a card off and then realize you don't remember how you made it (or what paper/stamp you used). Senior moment. PS - I'll try and remember to take a picture of the inside for you! Jen I love your hipster sushi card and I am the other person in this world who is not a sushi girl. Have tried a few times but also not my thing. 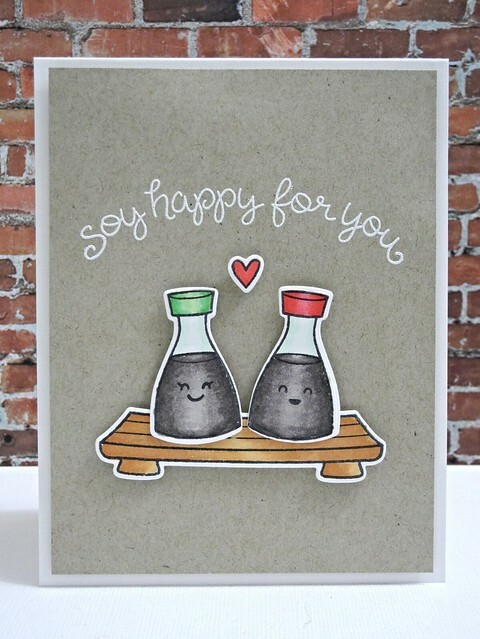 You card is pretty darn cute! I love love love puns : D. This one is delicious. Kudos on winning an awesome stamp set. I've loved sushi since it was "weird" to love it lol. Opposite end of the spectrum. Such a cute card! If it makes you feel better, I don't like sushi either, I don't use chopsticks and I'm second gen Japanese. I love all kinds of Japanese food, but I don't do the raw stuff. This is so cute and totally adorable! You are so inspiring and loved the Lawn Fawn especially!